Earlier this month, inspired by Taphophile and Louisa, I decided to set myself the 12 in 11 challenge. You might remember that the goal is to buy no more than 12 items of clothing across the year. I guess you might say I'm going very well. I bought no new items of clothing, as specified by this challenge, in January. But you can probably detect a tone of doubt about how I'm really doing. As I'd predicted in my initial post, I did go shopping for shoes to accommodate the heel cups that are meant to ease the pain from my heel spurs. It wasn't that the shoes I already had were an unsuitable style for the heel cups, but rather that by the time the heel cups were inserted, my shoes became too tight and my toes were mashed in the now-too-small space. So I didn't want to have to count this practical purchase in my precious yearly total of 12. You can probably guess what happened. I couldn't bring myself to buy any old pair of right-sized shoes on sale, but ended up with some rather expensive shoes I like. I've rationalised them by thinking that if I like them I'll wear them, and the dreaded heel cups, more frequently, and that if I recover from the heel spurs the larger-sized shoes will be perfect for wearing with hand knitted socks. But because I like them so much, I think I should include these shoes in my clothing count for the year. So, that's left 11 items for the next 11 months. Still not too bad. And there were other 'clothing' additions that unintentionally fell into the exclusions category. I had the lenses updated in some old, much-loved spectacle frames. This seems to fall into the 'make do and mend' category, except that it really was an extravagance. I already have other pairs of perfectly acceptable spectacle frames - it's just I have a bit of a passion for them. But despite feeling a twinge of guilt, I'm not going to count these amongst my items. And then there was the knitting I finished - a shawl/scarf I know I'll wear in winter, and a hat I probably won't. According to my rules, these are hand-made and clearly exclusions from the count. So, there it goes. I've bought one item so far in 2011, but I feel as if my wardrobe has expanded. I haven't cheated, but I feel as if I have. I wonder what February will bring. 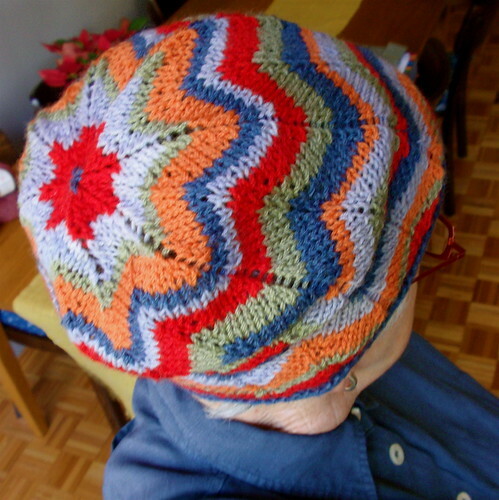 Like many others, I've fallen victim to the latest viral pattern on Ravelry, a Kirsten Kapur designed hat called Ida's Kitchen. I'm not at all sure how this happened. I have a list of things I want and need to knit that didn't include this hat, so this was just a frolic; a moment's distraction. Additionally, given that I lived through the extremes of 70s fashions, I'm not usually attracted to clothes that reference or recreate this period. It seems too recent to be fashionably 'retro'. 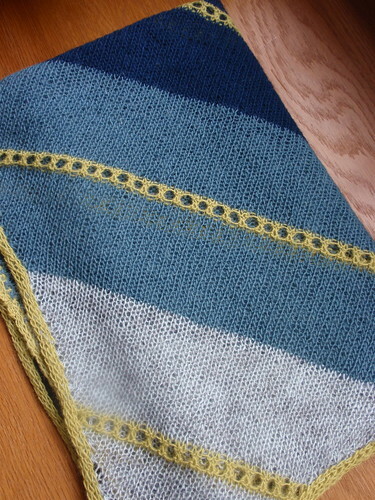 But I'm always attracted to stripes, and seem to be going through a particularly stripey period with my knitting. And this pattern uses chevrons, which I love. So, I have knitted this vaguely 70s, hippyish hat. I don't know what I'll do with it. At least I didn't buy yarn especially for it. 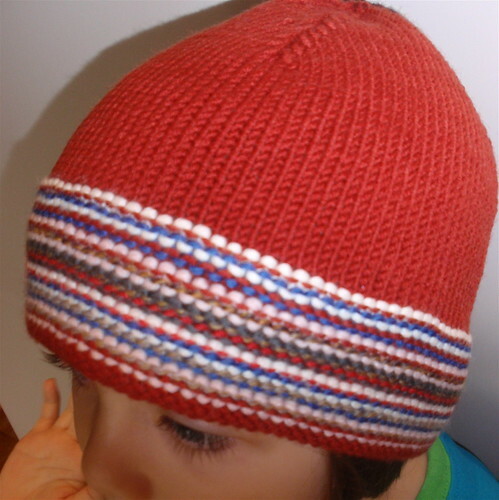 The pattern calls for 7 different colours of sport weight (5 ply) yarn. I had relatively small amounts of four colours in very basic Heirloom woollen yarn and decided to add some left-over grey Araucania Ranco. Even though it's sock yarn it's quite thick and I thought it would be good enough (which it is). 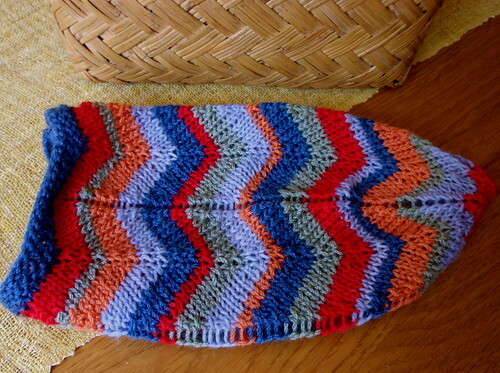 So, my stripey hat has only five colours, but I think that's sufficiently riotous. Even though I resisted buying yarn for my stripey hat, I have bought some yarn recently. I visited the newish Balmain location of the Calico and Ivy yarn and fabric store and chatted with its super-knowledgeable salesperson. The store is light-filled and charming and amongst many desirable fabric and yarn choices has what is probably my favourite yarn - Rowan Felted Tweed. I bought some skeins in a muted crushed raspberry colour and couldn't resist a skein of the blue-grey to match the tweedy flecks in the raspberry yarn. I have no project in mind, but made sure I have enough for a small shawl or a cardigan for my grand-daughter. 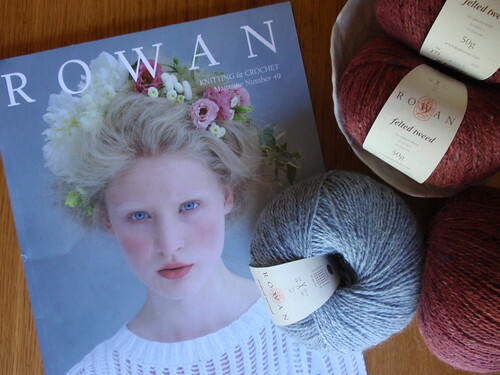 My copy of the latest Rowan pattern book arrived on the day I bought the yarn. Even when there is nothing I might conceivably want to knit from them - which is the case with this issue - I love the Rowan pattern books. I'm always seduced by their very English boho-chic styling. I'm more likely to covet the loose linen pants, flowing skirts and chunky bangles than I am to desire to knit any of the garments. And I have been knitting on a project I want - even if I don't need it. Shortly after Jared Flood's yarn Shelter was released, I bought some skeins in the colour called 'Wool Socks' to make the Terra scarf / shawl. 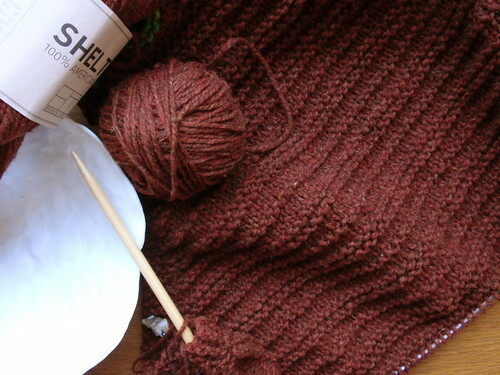 I was attracted by the lace in bulky yarn concept, and didn't even notice that the shawl had a significant base of broken garter stitch, as well as the lace. It now seems rather astonishing that I could have been so unobservant but, as you can imagine, I'm enjoying the regularity and geometry of the knitting. I just wish it wasn't so hot! This year, the Sydney Festival has passed me by. I was preoccupied when I needed to focus on the program and book tickets in advance; then I was busy or out of town over Christmas and New Year; and finally when I focussed on shows or events I might like to see they were already finished or booked out. Oh well, I guess there's always next year. But thanks to one of my friends I did get to see one thing. 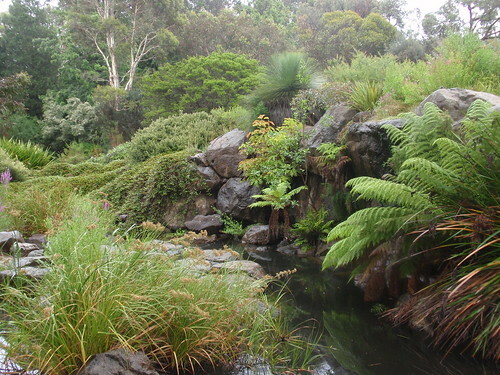 Sydney has a traditionally planned and planted Chinese Garden on the edge of Chinatown. It was a gift from Chinese sister city, Guandong, for Sydney's Bicentennial celebrations in 1988. [1788 was the year when British settlement of Australia occurred. Celebrating this settlement - which happens tomorrow on Australia Day, January 26, is always slightly uneasy as it can also been seen as marking the dispossession of Aboriginal Australians]. Anyway, the Chinese Garden is beautiful. 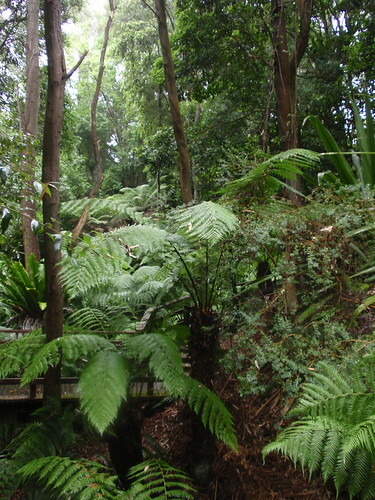 In the twenty years or so since it was planted the trees have grown to maturity and it's become a sanctuary in the middle of a very busy part of Sydney. This January the Gardens are the site for an event called Power Plant at Darling Harbour. 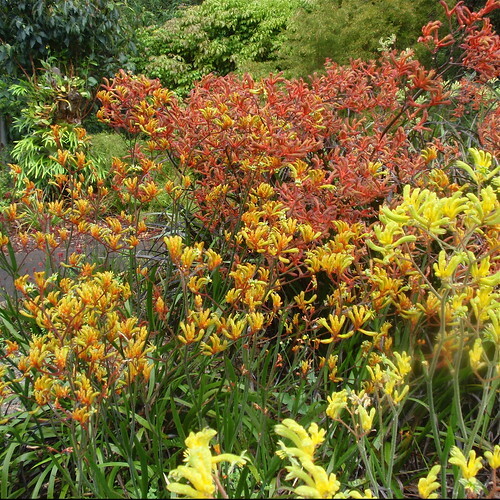 There are lighting installations throughout the Gardens, often coordinated with sounds. Some are absolutely magical; others less so. The organisers had done their best to regulate entry so the Garden wasn't too crowded, but nevertheless there were lots of people and consequently neither the quiet not leisure to linger that would really have done justice to some of works. 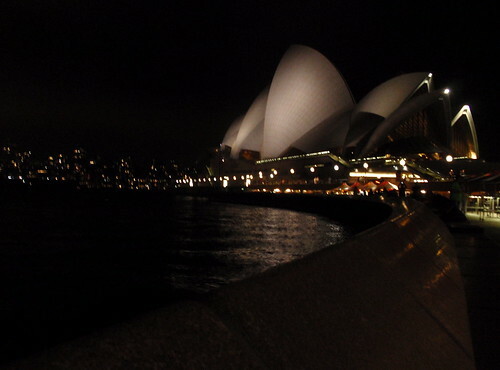 While it's not technically part of the Sydney Festival, I've also been to the opera to see Bizet's Carmen. This is not really one of my favourite operas. It's full of cliches and stereotypes, at least for a modern audience, and I guess it suffers from being just too familiar. The music has been used for advertisements, muzac, circuses, anything - you name it. I've seen the opera a number of times over the years, and after this recent viewing, while the music was going round and round in my head, I reflected on other experiences of seeing Carmen. I didn't grow up with opera - not even Carmen - but I did go to the movies (the pictures) a lot as a child. I first encountered Bizet's music in Carmen Jones, a film made in the mid-fifties. My hazy recollection is that the film was quite faithful to Bizet's score, but that the story was set during the second world war and the whole cast were African Americans. The role of Escamillio, the matador of the opera, was rewritten as a boxer. Even now, every time I hear the the 'Toreador' music from Carmen, I have the lyrics from Carmen Jones running through my head - 'Stand up and fight until you hear the bell...'. I really must watch the movie again. I also remember seeing the exquisite Australian ballerina, Lucette Aldous, sometime in the early 1970s, dancing with Garry Norman in the ballet that is set to Bizet's score. I remember it because it was probably the most emotionally moving dance I've ever seen. 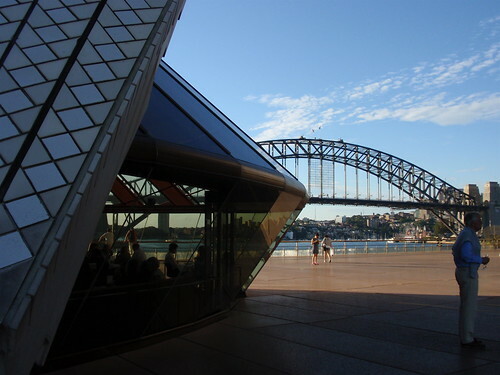 But to return to the current Opera Australian performance. It was very good, without being wonderful. There was lots of colour and movement, splendid sets and costumes, Australia's towering opera heart-throb Teddy Tahu Rhodes as the bull-fighter Escamillo, and an extremely good performance from visiting artist Rinat Shaham as Carmen. She not only sang passionately, but looked the part, acted convincingly, and danced well. All very enjoyable. 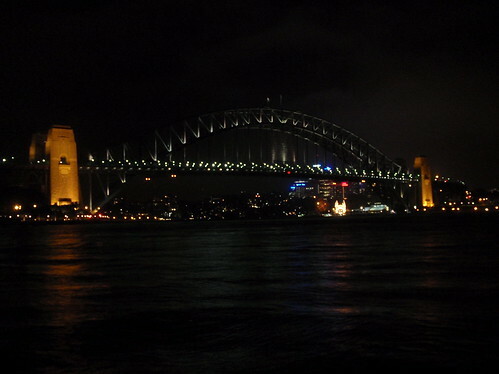 and to leave after several hours of delightful music to discover a cooling southerly breeze and the city lights. My enthusiasm for this shawl has waned a bit as I've been knitting it. I think the colours are not working as well as I was confident they would when I chose them. Maybe it's because I'm finishing the shawl in summer, but somehow the colours seem a bit heavy and muddy. Anyway, it's way too hot to wear it for a few months, so I'll withhold my final judgment till winter comes and I see how it looks with winter clothes and in winter light. It's also a bit smaller than I'd anticipated - 168cm x 50cm - so it will probably function better as a generous scarf than a smallish stole. 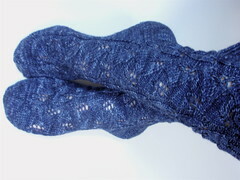 But I love the laceweight yarn - Isager 100% wool - with its rather catchy texture. And the pattern, which is constructed on the bias, is simple and ingenious. It's 'Dawn' by Grace Anna Farrow, from her collection of similarly constructed patterns, The Fine Line. The knitting is very straight-forward stocking stitch, but the attached i-cord edging took me ages to do. I also had to do a bit of experimenting to get the i-cord to the right tension to suit the bias edge of the stole. Anyway, another finished project I can count for 2011. 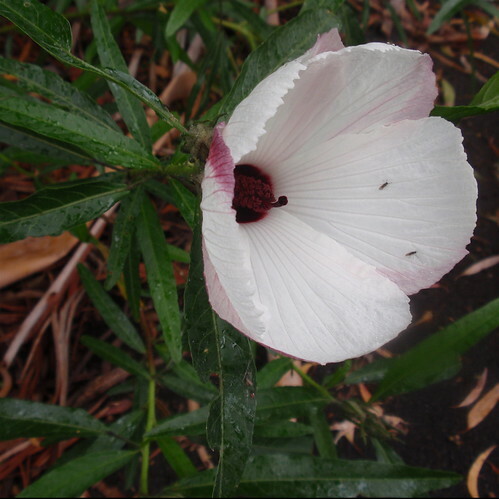 I've been struck down by envy while reading this blogpost. The jewellery. The spectacles. The hats. Swoon. Maybe I'd be a more productive knitter if my grand-daughter came to visit more frequently. While she was staying with me over New Year I faced up to the fact that I needed to finish the cardigan for her that I'd begun more than six months ago if she was to benefit from it before growing too much more. 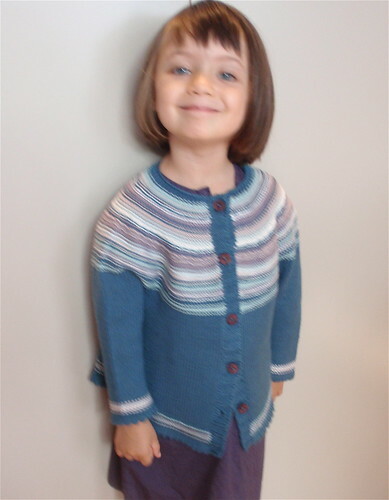 It's the Playful Stripes Cardigan by Alana Dakos (Never Not Knitting), who produces perfect patterns for little girls - modern, useful, and not too 'pretty'. 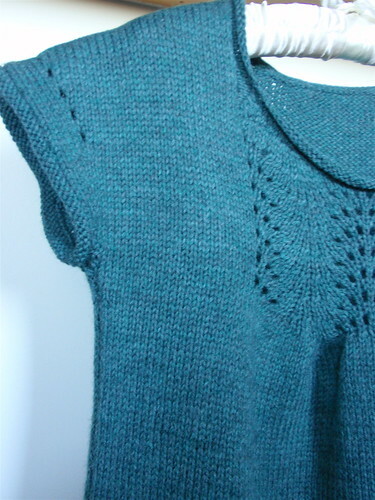 This one's knitted from Debbie Bliss Cashmerino in an aqua-blue shade that suits my grand-daughter. 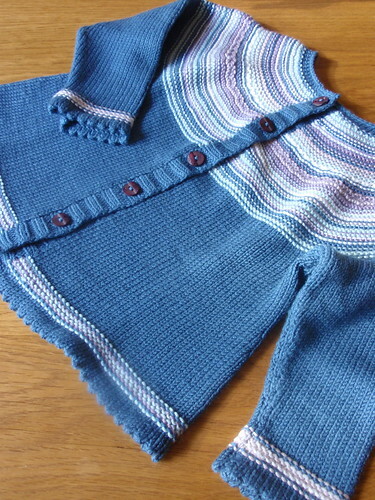 I love stripes, and am particularly taken by the reverse garter-stitch yoke of this cardigan. The one disadvantage of the pattern is that even though it's knitted in the round in one piece, there's a great deal of finishing - all the edges from the stripes need to be sewn in, the button bands picked up and knitted on, and the picot hems sewn up (I'd knit them in if I were to make this again). In fact, the reason this cardi took so long to finish was that it languished in my knitting bag for ages, waiting for me to sew in the ends. 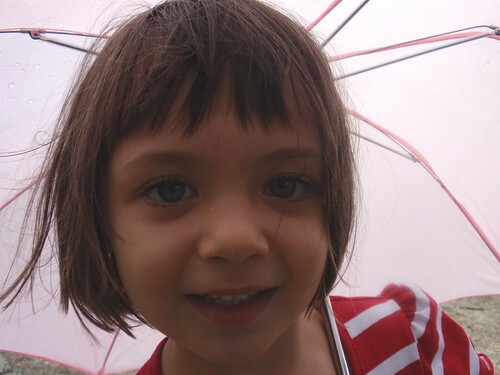 One day Ana Maria asked if I could knit her a beebie. 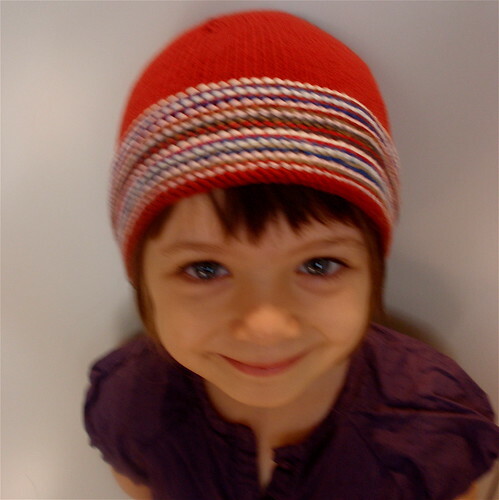 After initial puzzlement I worked out she wanted a hat - a beanie. A couple of days later when the hat was on the needles I asked her how she liked her beebie. She looked at me witheringly and said 'It's not a beebie - it's a beanie'. They move on very quickly at three-and-a-half. Like most knitters I love receiving knitting requests - at least from people I love - and so we jointly chose the yarn from my stash and I cast on for my tried and true favourite beanie - Mustaa Villaa's Garter Stitch Beanie. This hat is knitted in 8ply yarn (dk) to quite a dense gauge - I know from experience that it makes a warm and very sturdy beanie. You can see my liking for reverse garter-stitch stripes again - and the stripes give you the opportunity to use up scraps of yarn, including sock yarn used double. I've discovered that almost any combination of colours in the stripes looks good, as long as you include a couple of stripes of the main hat colour. So, in a few days I had a satisfactorily finished cardigan that had been waiting far too long, and a smart new hat. I've had a quick visit to Canberra this weekend for my sister-in-law's surprise birthday party. Her children had organised it and she truly was surprised and, fortunately, delighted. I long ago learned that you can always find ways to cram in additional pleasures and distractions when you go visiting. My first self-indulgence was to stay overnight at University House at the Australian National University. This used to be a residence for post-graduate students and a club for university staff, but for the last ten years or so it's been used as a place where anyone can stay. 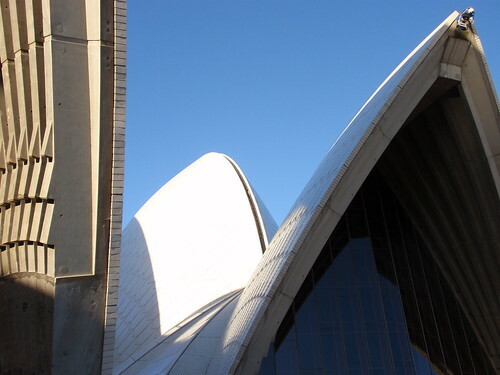 It's not very grand or luxurious, but it's probably the most wonderfully preserved example of mid-twentieth century architecture you could find in Australia. It was designed in the late 1940s and opened by the Duke of Edinburgh (no less) in 1954. It's a simple building with low, horizontal lines, built around a central courtyard with a pool edging one curved side of the courtyard. 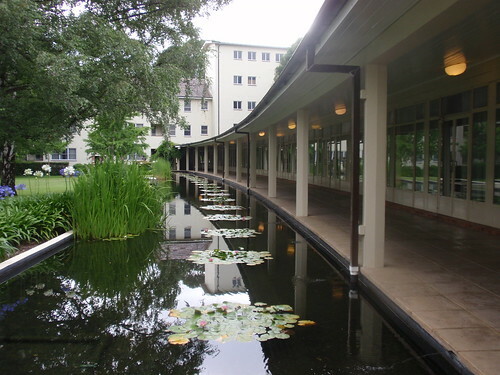 The gardens and trees also date from the 1950s and the rooms are still furnished with the original simple, specially constructed, blocky wooden furniture. The building was planned to be 'unpretentious without extravagance' - and it certainly is. But now it also seems elegant, simple and restrained. 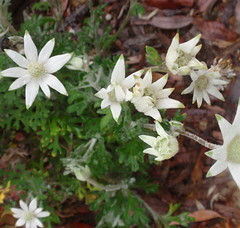 But as always, as an absolute amateur of gardens and gardening, I was most attracted by the flowers. 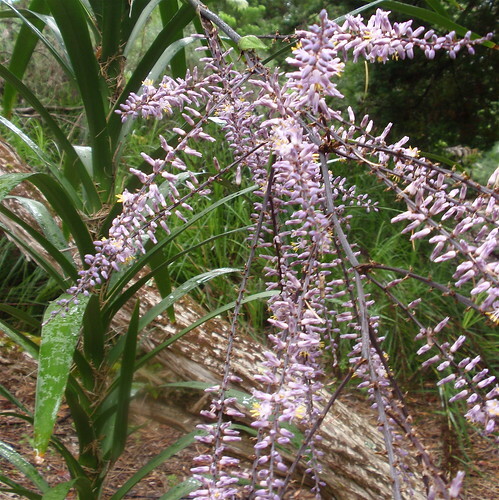 The Gardens recreate landscapes from different areas of Australia, so for non-purists like me who don't insist that plantings are local, it was wonderful to see such diverse plants - and particularly the variety of flowers in bloom. 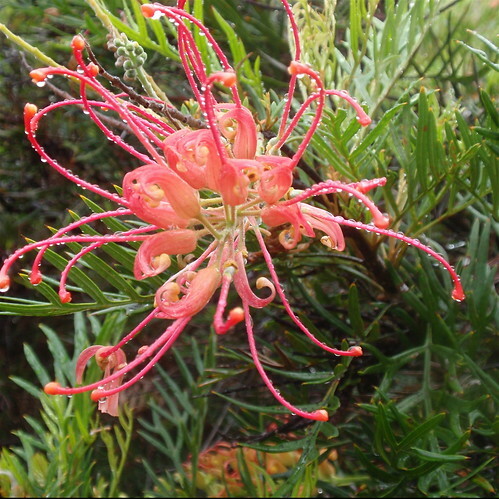 Now if I'd been a really diligent tourist I could have noted the botanical names of the flowers from the meticulous labels so I could impress you all with my botanical knowledge, but what with juggling an umbrella and camera and generally enjoying the morning, I just couldn't be bothered. Yesterday, on Taphophile's blog, I read of a challenge she's set herself for 2011 - to buy only 12 items of clothing in 2011. She borrowed the idea from The Really Good Life. I've often been tempted by challenges of the 'make do and mend' variety, but have found them a bit too austere and daunting. Twelve items of clothing in 2011 seems manageable. I've slept on the idea since reading Taphi's blog yesterday and have decided I'm in. You might ask why I would want to do something like this, given the extent to which clothes are one of the great pleasures of my life. I think the primary reason is to save money - or at least prove to myself that I can be more frugal and restrained as I rapidly approach a time of significantly diminished income. Though who knows? If I limit myself to only twelve items I might feel each has to be a significant investment. I've always felt slightly guilty about the extent to which I love clothes (though it doesn't take much to make me feel guilty about anything). At various times I've felt I spent too much money on them, and at other times, particularly more recently, I've spent more modestly. But I know I get just as much pleasure - and often better results - from recombining or rethinking how to wear the clothes I already own than I do from buying new ones, so I can learn to indulge my clothes passion in a different way. And there's also still the nagging realisation that there's just too much stuff in my life, and this is one strategy to limit new acquisitions. Moving house was great for acknowledging just how much stuff I have. I did throw out some clothes, but there are still more than enough to keep me going for some time. Fortunately, it's a long time since I dressed 'fashionably', so it's unlikely my clothes will go further out of fashion. * Essential footwear. Initially I was going to delete this exception as the examples given were new sports shoes when the old ones die, or gumboots or essential footwear for safety - none of which I own. But for the last several months I've been enduring some very painful heel spurs and I think I might have to buy some shoes specifically to help deal with this. Given what they'll probably look like, I'd hate to think I'd have to count them as one of my precious 12 purchases. * Essential underwear – bras and undies are exempt but on a replacement basis only. Hosiery is exempt but purchases are to be minimal. I'll add pyjamas to this list as my current nightwear is appallingly ragged and in need of replacement. * Gifts - gifts of clothing are exempt, but clothing gifts must not be solicited. * Stuff made for oneself. I don't sew, but this does allow me to knit for myself (preferably from stash). I'll also mend and repair - though I do that anyway. So, let's see how I go. I'll report my purchases here on my blog to keep me honest. Any other takers? In December 2009 I did a round-up of my film viewing for that year and listed the five best films I'd seen. I'm running a bit late with my summary for 2010, but trying to decide what was worth-while, with a little bit of distance and a number of films for comparison, still seems a good idea. I felt I'd seen significantly fewer films in 2010 than I had in previous years so was surprised to discover that while my film-viewing was down - I'd seen 52 films for the year, an average of one a week - it compared better than I had expected with the 60 I'd seen in 2009. Still, it feels as if most of my 2010 list is made up either of movies I went to see for my monthly film discussion group or films I saw at the Sydney Film Festival. I saw embarrassingly few Australian films last year - only four of them - along with ten from the UK, 23 from the USA and nineteen from other, mostly LOTE (language other than English) countries. And yes, that adds up to more than 52 because a surprisingly large number of the movies I saw last year were co-productions across countries. As for 2009, there's a preponderance of films from the USA because that's just the way the film industry is, rather than because I have a preference for films from the USA. Essentially, my film viewing habits haven't changed. I don't watch DVDs as I find I'm too easily distracted to concentrate on the movie as completely as I would like. (As an aside, I have an hypothesis that people in cinemas are getting noisier because they're transferring their at-home DVD watching behavior to the cinema...or maybe I'm just getting older and grumpier). So, all the movies listed (apart from a few I saw on a plane) were viewed in the cinema. Overall, I think there were fewer wonderful films in 2010 than in the previous year. My 'five best' list is just as grim as it was in 2009 which says more about my preferences than it does about the range of movies being made. A number of movies not among my top five distracted or entertained or pleased me for a variety of reasons - I loved the design and costume elegance of Jane Campion's Bright Star and I Am Love with the incomparable Tilda Swinton; I was delighted by the unpretentious exuberance of Bran Nue Dae; I sat on the edge of my seat anticipating disaster which never eventuated throughout the Russian film How I Ended This Summer; I learned so much that is deeply relevant for our times from The Most Dangerous Man in America (the story of Daniel Ellsberg and the Pentagon Papers); and I uncritically relished seeing two of the Millenium series of novels, The Girl With the Dragon Tattoo and The Girl Who Played With Fire, transferred to film. After much debate and indecision my top film is German director Michael Haneke's The White Ribbon. The austere, black-and-white film is set in a German village immediately prior to the outbreak of WWI and I think it is a meditation on the nature of evil. It has also been described as an allegory of the lead-up to Fascism in 1920s and 30s Germany but, as long as you aren't seeking easy answers to the meaning of the film, I think it works well without having to be viewed as an allegory of anything. The village of the film has all the claustrophobia of small, enclosed communities where neighbours can half-know but ignore horrendous practices behind closed doors. The most scarifying thing about the film is that it depicts even children as having the capacity for evil-doing. Thought-provoking and gripping. A close runner-up is the Australian film Animal Kingdom, directed by David Michod. A lot of other people must also think this film is wonderful as it was voted best picture at the Australian Film Industry (AFI) awards as well as receiving the Grand Jury Prize at the Sundance Film Festival. There's recently been a whole lot of often indifferent or even distasteful television series and films focusing on the criminal underworld in Australia, and I was initially fearful this would be yet another of them. It is a film about a family of criminals, but it's also about how the individuals in that family are shaped by their environment and about how horrific deeds can become 'normalised' through repetition and the expectations of others. Veteran Australian actor Jackie Weaver has been justly lauded for her portrayal of the family matriarch (and has been nominated for a Golden Globe award for her role) but I think the stand-out performance is Ben Mendelshon as the menacing older brother and armed robber. For once, a great Australian script. My number three is the American anti-war (in my view) film, The Hurt Locker. For once, I think the Oscar voters got it right, as this was voted best motion picture for 2010. It's the story of an elite bomb-disposal squad in Iraq, where it it is never clear who is the enemy or where is safe. After the very early death of the Guy Pearce character, the squad acquires a new leader who seems to take risk-taking to unsafe and dangerous levels. The film revels something of its central characters and their motivations, but I think its great achievement is in making you confront the difficulty of returning from such experiences to the everyday world. As I became older and realised what 'ordinary ' men of my father's generation had been required to do during the second world war I was amazed at how they were expected to master the sudden transformation from war to home. Among other things, this film explores that transformation. A superb performance from Jeremy Renner who was also wonderful in the recent Ben Affleck movie The Town. Number 4 is Winter's Bone. This has to be one of the most perfectly-made movies ever. It's a 'small' movie set within an isolated community in the Ozark mountains in Missouri. It's a community beyond the fringe of legality, comfort and safety where moonshine liquor would have been made during prohibition, marihuana grown in the 70s and 80s, and amphetamines cooked in current times. The centre of the story is a seventeen year old girl, Ree, who cares for her demented mother and young brother and sister. Their ramshackle house and the land around it is all that lies between the family and destitution, but her father has used the property as his bond to be released on bail from a drugs charge. Ree needs to ensure her father honours his bond to maintain their house. What's so wonderful about the film is its evocation of the community where 'family' can be just as dangerous as being an outsider. One of the unexpected wonders of the film was the music with the simple melodies and aching harmonies that make up some of the best traditional music from such mountain regions of the USA. And a documentary to round things out - the China/Canada co-production Last Train Home. This feature-length documentary was made over several years and traces the annual, grueling journey that is made for Chinese New Year by more than 200 million (!!!) workers from the manufacturing areas of eastern China to their home provinces often thousands of kilometers distant. The parents at the centre of the film have left their now teen-aged children with their grand-parents so that they can work for minimal wages in appalling conditions in factories to ensure a better life for the children. In the way of such sacrifices, the children resent their parents' absence and the stress that is placed on school performance and dutifulness. The tragic but inevitable cost of rapid change and industrialisation is devastatingly clear. I thought I saw somewhere that this documentary was to be shown on TV on SBS (or maybe has been shown?) but can no longer find any trace of it. But do see it if you have the opportunity. So, they're my picks for 2010. Pretty grim, but I think uncontroversial in terms of quality. Any comments? Anyone else have any favourites or suggestions? In counting up my knitting for last year (isn't it wonderful to have a record in Ravelry?) I was pleasantly surprised to find I'd completed fifteen projects. 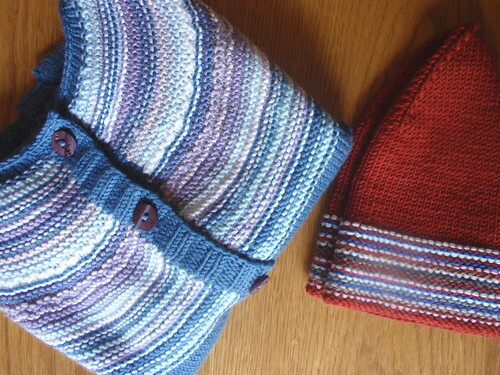 This was a significant decrease from the 24 and 23 I'd knitted in 2009 and 2008 and none of them was particularly large or complex, but even so I was pleased with what I managed to achieve in a very busy year that included moving house and renovating. 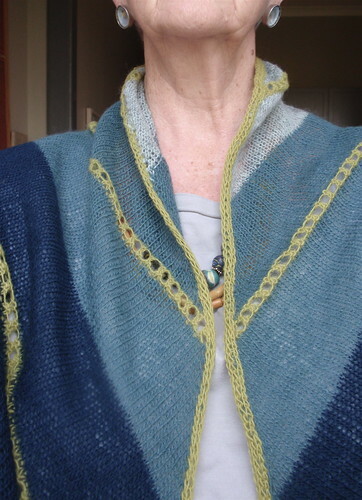 The project of which I'm most proud is my version of the Sage Remedy sleeveless jumper (sweater for those from North America). This was neither particularly difficult nor time consuming, but completing a garment as distinct from an accessory is an achievement for me. 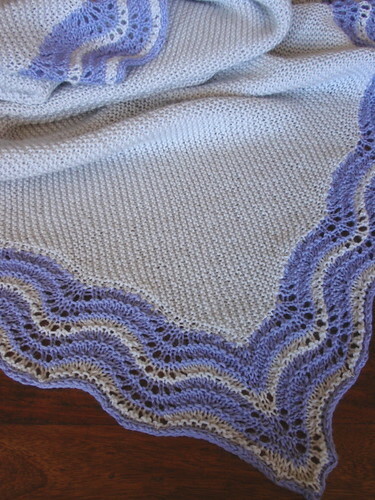 The most favourited project on Ravelry was the Silvery Baby Blanket, using Jared Flood's Tweed Baby Blanket design. I think this appealed particularly because of the colour combination of silvery-grey and lavender. The piece of knitting that's been most worn (though it's probably the project with the most errors) is my version of the Citron shawl. It's just so wearable. Because it's knitted from laceweight yarn it's very soft, light and snuggly, and because it's bright red it's cheering to wear it with my grey and black winter clothes. The most fun to knit? 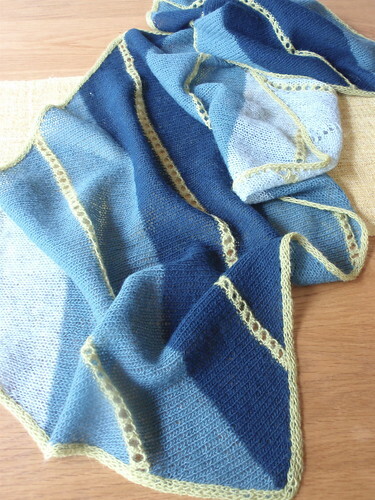 Probably the shawl I knitted using Mustaa Villaa's variation on the Wool Peddler's Shawl. 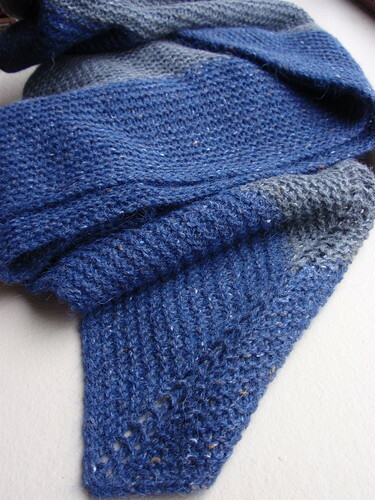 This is a very simple knit that combines two of my favourite knitty things - garter stitch and tweedy yarn. I'm nothing if not predictable. I've a couple of other projects I'd hoped to finish by the end of the year, but they were overtaken by the knitting flurry needed to meet Personal Sock Club completion deadlines. But the good side of my failure to finish is that they'll make my 2011 total look more respectable. 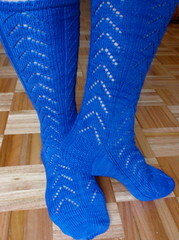 I completed the sixth pair of socks planned for my 2010 Personal Sock Club on December 27. Perfect timing, made even more perfect by being able to give them immediately to the friend for whom they were made, as we were visiting her just as they were completed. The socks are yet another design from Nancy Bush's wonderful Knitting Vintage Socks - Child's Sock in Miranda Pattern. It's unexpectedly lacy with yarn overs and knit 2 togethers forming small, regular geometric patterns. It's otherwise just a classic sock. Very satisfying. 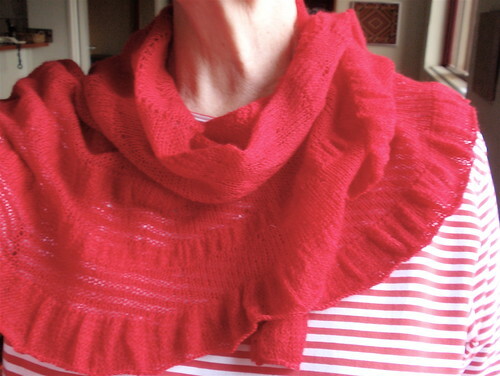 I knitted on 2.25 dpns and used Malabrigo Sock yarn in Botticelli Red - a yarn and colour I'd also used for my Central Desert Shawl. Clearly, I like it. 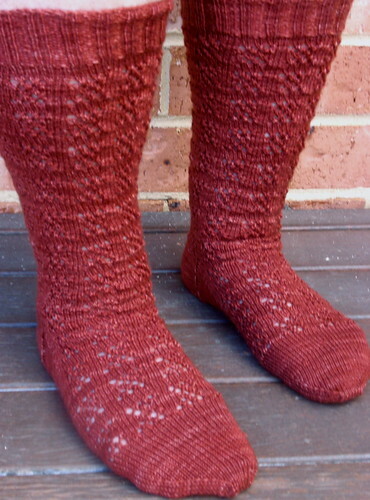 All in all, I've knitted seven pairs of socks in 2010. Several years ago when I took up knitting again I was initially puzzled by the popularity of sock knitting. I couldn't imagine wearing hand-knitted socks with most of my shoes (indeed, I still can't) and was of the view that they were rather useless. But that was before I discovered the delight of wearing knitted socks with the shoes they do complement and the creativity involved in choosing how and when and with what to wear them. It was also before I discovered just how delighted many of my friends are to receive socks as a gift - some are on to their second pair. 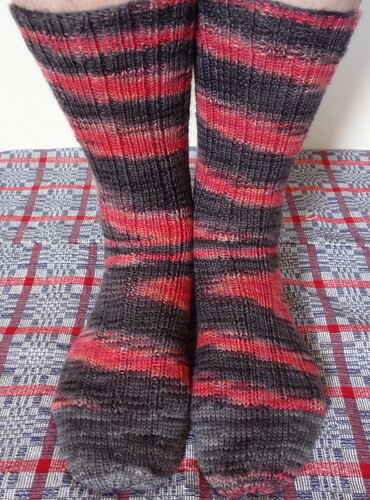 Together with the red socks at the beginning of my post, these made up the six pairs of my 2010 Personal Sock Club. 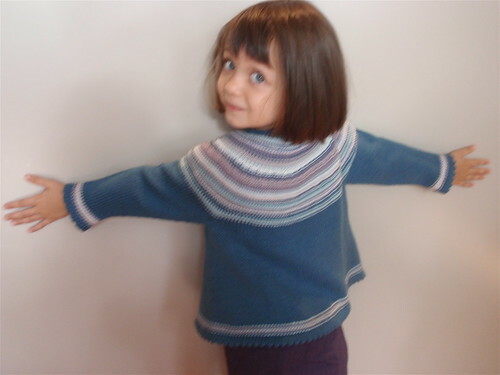 Details of patterns and yarns are on my Ravelry projects page. Predictably, four of the six patterns I chose were by Nancy Bush. All the socks worked well, though my favourites by far are the extra-long Latvian Socks in vibrant deep-blue Wollmeise yarn. I'm still plotting ways to wear them. 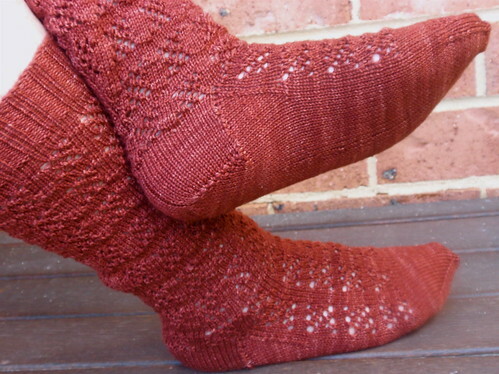 I was a bit distracted from my PSC early in the year when I found myself coveting a pair of short socks with frilled tops from Judy Sumner's Knitting Socks East and West. These are great fun and have had a lot of wear. So, on to 2011. Given my Personal Sock Club success in 2009 and 2010, I'm knitting socks again in 2011 - but with a twist. 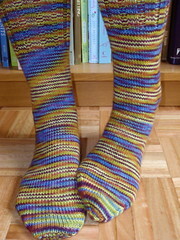 The S61011 group on Ravelry is a group knit-a-long Personal Sock Club - if that's not a contradiction in terms. We've voted on six sock patterns for the year, each with a two-monthly time frame. Socks are to be knitted from yarns already owned, which I've stowed away to have them revealed every two months - hopefully as a pleasant surprise. 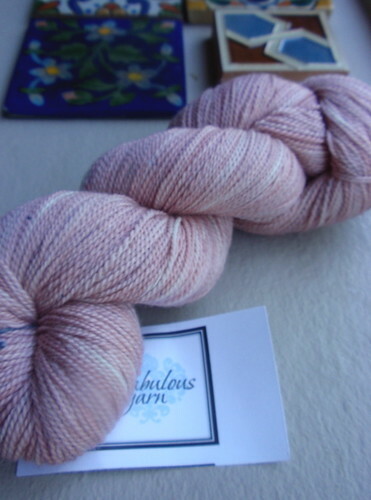 The first pattern for us all is Socktopus Design's Shur'tugal, and the randomly chosen yarn I'll be using is Knitabulous's Supertwist Merino in perfectly named Pink Salt. However, I'm not rushing to cast on just yet. I know I have plenty of time for these before the deadline and I have a number of other almost finished projects I really want to complete before I begin yet another round of sock knitting - however enjoyable I've found it to be. 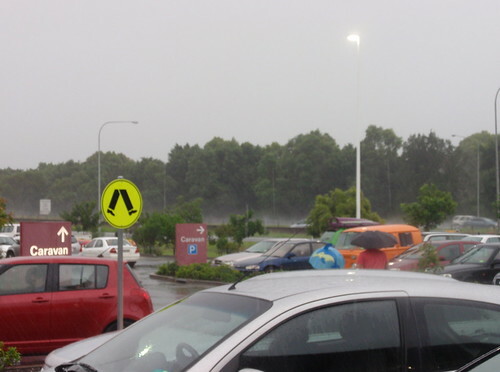 I've been to Brisbane to spend Christmas with my daughter, son-in-law and grand-daughter. We haven't really had strong Christmas traditions within my family. From time to time we've spent Christmas in the Philippines, and often one or more of us has been away at Christmas time. But over the years we've accumulated a collection of Christmas ornaments for the tree from various countries - brought out in the years when enough of us are together to warrant a Christmas tree, and carefully packed away by Three Kings. 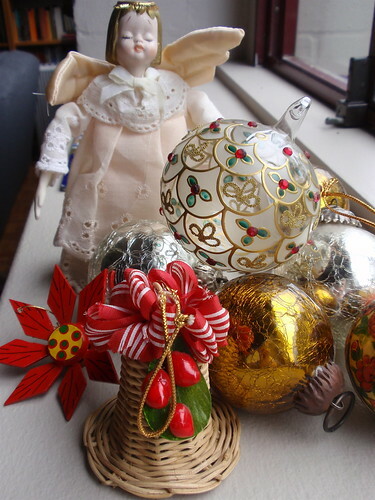 This year I selected a few ornaments to keep for myself, and took the remainder to Brisbane to be kept by my daughter. A small happening, but one that seems laden with significance. It's a change in the centre of gravity for the family - young children bring such a sense of the future and of continuity (and, inevitably, change). 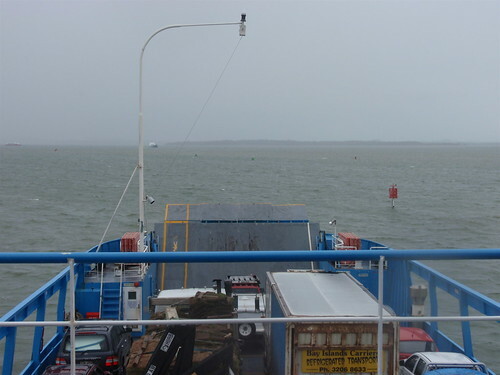 We made a day trip to Stradbroke Island - a large, still relatively undeveloped and unspoiled island off the east coast of Brisbane - that we reached by taking our car on a ferry. Somehow, that makes it feel like a very significant excursion. 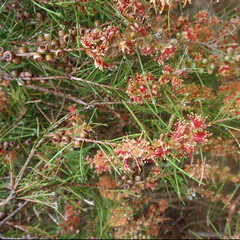 My main association for Stradbroke prior to visiting had been as the poet Oodgeroo Noonuccal's country. 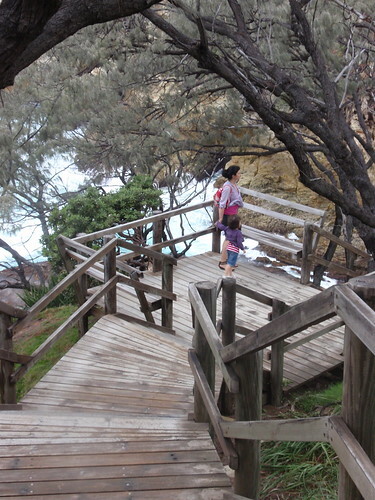 though I also loved the modern walkways along the cliffs and coastline that give easy access (particularly on rainy days!) to views of such grandeur. I'm continuing my admiration affair with the Queensland Art Gallery and, in particular, the Gallery of Modern Art. GoMA currently has an exhibition, 21st Century: Art in the First Decade which collects together some of their own works with some past favourites and new works. 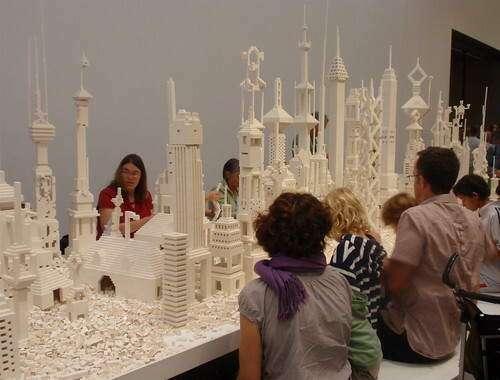 What I admire so much is the way the Gallery has made art accessible to so many people. When I visited Brisbane in November I went to see the retrospective of the couturier Valentino's work. There were queues out the door, and many groups, particularly of young women, had dressed up in their best to visit the exhibition. 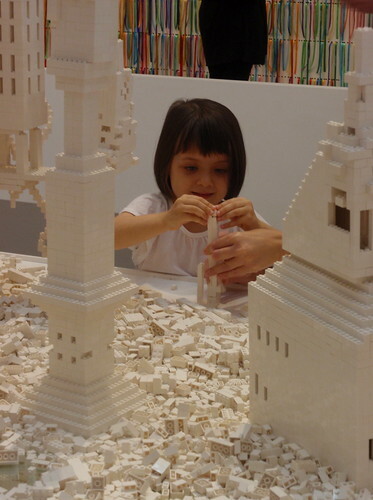 This time there were lots of families with children as GoMA had taken great care to select a number of the works that were participatory and child-friendly. We spent more than two hours in the Gallery with a delighted three (and-a-half) year old, and all left wanting to see more. 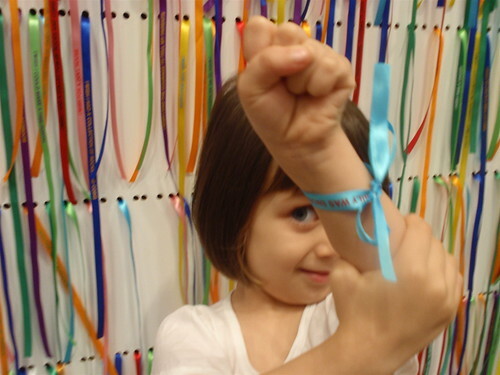 There was a wall of ribbons, each printed with a wish from a Brazilian child. You could take a wish, tie it around your wrist, and add a wish of your own, written on paper, rolled into a small tube and inserted in the holes from which ribbons had been removed. A room two-thirds filled with purple balloons was great fun. 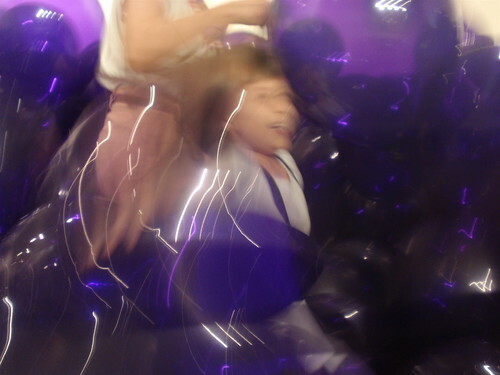 Five people at a time were allowed into the room and could move through the balloons. Everybody emerged with grins of delight and hair flying every-which-way from the static electricity generated by contact with the balloons. Everybody watching had almost as much fun as the participants. While I was away it rained...and rained...and rained. 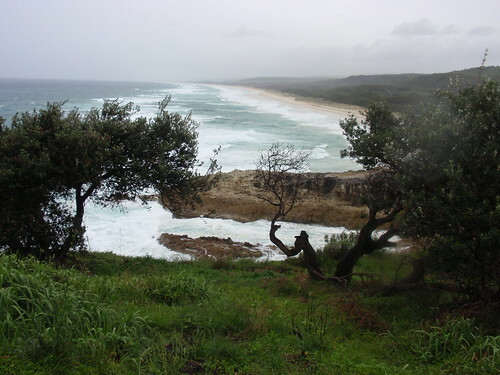 We drove from Brisbane to Lennox Head to visit an old friend and drove through what seemed to be sheets of rain. At one point we had to make a detour because the road was covered with water too deep for my small car to drive through. 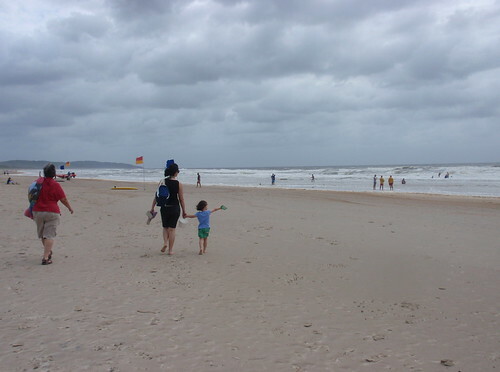 The rain mainly ceased while we were in Lennox Head, but the wind and choppy water meant that swimming at the beach was not appealing - the beach was even closed for swimming for some of the time. 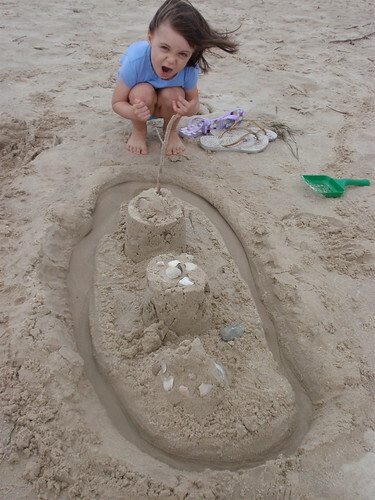 Fortunately, the beach has pleasures other than swimming.